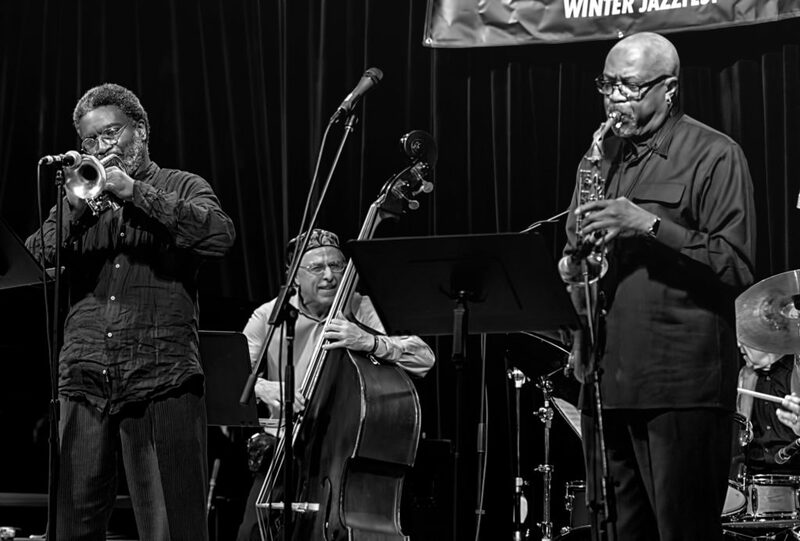 Four boundary-pushing innovators converge in this collective quartet: saxophonist Oliver Lake, cornetist Graham Haynes, bassist Joe Fonda, and drummer Barry Altschul. Lake’s multi-disciplinary approach that can be traced back to his formative years with the Black Artists Group, the innovative St. Louis collective of musicians, poets, dancers and painters he helped architect over 35 years ago. He is a co-founder of the acclaimed World Saxophone Quartet, and his wide-ranging collaborators including Björk, Lou Reed, A Tribe Called Quest, Anthony Braxton, James Blood Ulmer, and Vijay Iyer. The Bronx-born Altschul was a member of one of the most important ensembles of the 1970s, Circle, with Chick Corea, Dave Holland and Anthony Braxton. He’s also made records with Julius Hemphill, Alan Silva, Andrew Hill, and the late violinist Billy Bang. Over his 35-year career, cornetist Graham Haynes, the son of drummer Roy Haynes, has pushed jazz beyond its traditional boundaries, co-founding the M-Base Collective with Steve Coleman and collaborating with Cassandra Wilson, Vernon Reid, Meshell Ndegeocello, The Roots, David Murray, Ed Blackwell, Bill Laswell and Bill Dixon. Joe Fonda is perhaps best known as Anthony Braxton’s bassist of choice for much of the 1990s, but he has made vital contributions to the Fonda-Stevens Group, the Nu Band, Conference Call, the FAB Trio and the Michael Musillami Trio and worked closely with Wadada Leo Smith, Archie Shepp, Ken McIntyre, Satoko Fujii, Bill and Kenny Barron, Randy Weston, Han Bennink and Karl Berger.